Our very own Debbie Taylor is a talented chef as well as an amazing quilter. Everyone in the office is always clamoring for her mouth-watering recipes. Every Saturday, we will post one of her delicious and decadent recipes so you can see why! 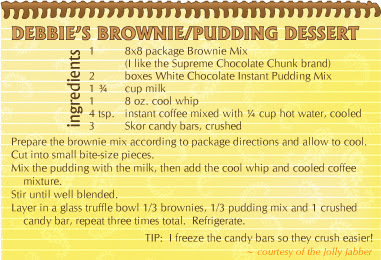 This is my favorite dessert recipe in my “recipe box” and it is the most asked for! Enjoy, and watch for Monday's blog from Sandy Gervais!